When she entered the Congregation of the Hospital Sisters, a career was the furthest thing from her mind. She was ready to devote her life to God and the service of His people. However, the path that God paved for her was something that most women, including those not in Religious Life, could not imagine possible. In 1979 Sister Marianna’s calling was to be one of the first women CEOs of a multibillion dollar corporation. It was at this time that she was named Executive Vice President of Hospital Sisters Health System – a system only three other religious communities could identify with at that time. She pioneered the process that brought the Hospital Sisters of St. Francis to the concept of a corporate system which continues today to be recognized throughout the United States and the world. “Sister Marianna had the vision to keep the sponsoring body at the realm of control in a centralized base. 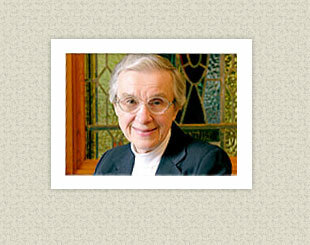 Her expertise, creativity, love, concern and desire to see all 13 hospitals and other missions of our Community continue with the Mission and Philosophy of Catholic health care led to the years she put into creating Hospital Sisters Health System,” wrote Sister Mary Ann Minor, present General Superior, in 1992 to the Catholic Health Association. Sister Marianna was born August 4, 1922 in Whiting, Indiana. After high school she took a job as a secretary. It was 1941 and her friends were signing up to help in the war effort but she thought, “Maybe I should be serving the Lord.” A friend invited her on a weekend retreat where she asked the Franciscan Friar in charge if he thought she had a religious vocation. He sent her to visit a “nice Franciscan group in Springfield, IL." "It seemed like home,” she remembers. After much discernment, she entered the Community on September 8, 1943 and although the Hospital Sisters were known as a nursing Order, Sister Marianna expressed a preference to do secretarial work. Despite her lack of interest in being a nurse, she was informed that she would attend St. John’s School of Nursing. “I remember sitting up in the balcony of St. John’s Hospital Chapel facing a picture of the healing Christ and I said, ‘Well Lord if this is what you want you’re just going to have to help me.’ I was in tears because I just didn’t know how I was going to do it.” She was later told that she would leave nursing school to attend college and later received a bachelor’s degree in food and nutrition from Fontbonne College, St. Louis, MO. After graduation, she then worked as a dietitian at the Sisters’ hospitals in Eau Claire, WI and Belleville, IL. Her next assignment was managing the dietary department at St. Mary’s Hospital (Decatur, IL) after which time she was informed that she was to be superior administrator of St. Anthony’s Memorial Hospital (Effingham, IL) – a position she held for nearly six years. True to the Sisters’ vow of Obedience, Sister Marianna was accepting to whatever the Lord had planned for her. Her next assignment took her back to Decatur as administrator of St. Mary’s for 14 months. She then returned to the Motherhouse to serve on the Provincial Council. She later earned a master’s degree in Administrative Sciences from Notre Dame University. At this time the Sisters were discussing the future of their hospitals because there were no longer enough Sister administrators. Meanwhile, other Congregations were closing their hospitals or turning them over to be run as community facilities. In the late 1970s, the Sisters established a holding company with a parent corporation and subsidiary corporations. The members of the parent corporation would be the Provincial Council who were similar to major stockholders. The health system would be the holding company and the hospitals the subsidiary corporations. On January 1, 1979, the Sisters established Hospital Sisters Health System (HSHS). Since her term as Provincial Superior was completed, Sister Marianna was named executive vice president. In 1980 she became president of the system, a position she held until her retirement in 1989. One of her main contributions was writing up the administrative manual, which details how the Sisters’ hospitals related to the System and the central procedures that would follow throughout. To keep her intellectually stimulated, she also works on German translations. The Sisters have a volume published in German for their 150th anniversary that has some sections to be translated and there are letters and lectures in the Archives that have not been translated into English. For Sister Marianna, life is a Divine romance. “Be open to the Spirit and see where the Lord is calling you. All people are called to holiness and we should strive to develop a greater love with our neighbor and in doing so, will share our love with the Lord,” she concluded.